On September 28, 1939, Ribbentrop and Molotov signed the so-called German-Soviet Boundary and Friendship Treaty as a supplement to the "territorial and political transformation" of Eastern Europe to which they had already agreed on August 23, 1939. This map shows the final demarcation line between the two aggressors’ spheres of interest, which ran along the Narew, Bug and San rivers. The Eastern part of Poland, inhabited mainly by Belorussians and Ukrainians, was annexed to the Belorussian and Ukrainian Soviet Socialist Republics. 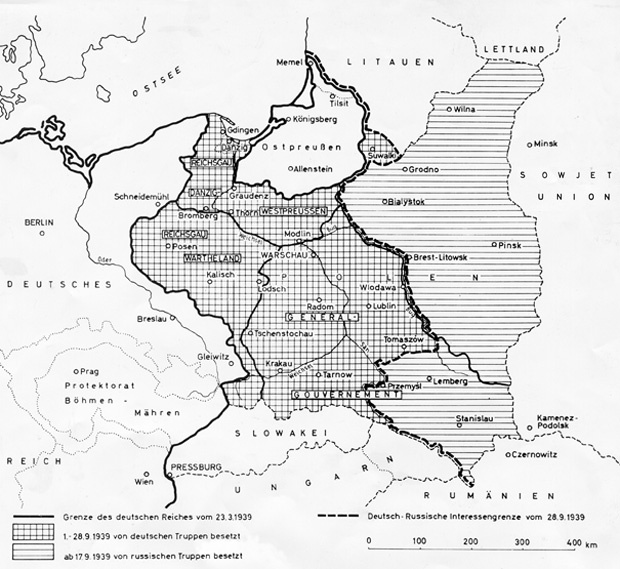 The Nazi government incorporated the new districts of Wartheland and Danzig-West Prussia into the German Reich and subjected the rest of the territory to brutal German occupation rule under the "General Government." Shortly thereafter, Stalin began to forcibly establish military bases in the Baltic states, which were eventually occupied by the Soviet Union in June 1940 and finally annexed as Soviet republics. Click on print version (below) for the PDF file. Note: The solid black line represents the border of the German Reich on March 23, 1939; the checkered territory was occupied by German troops from September 1-September 28, 1939; the striped territory was occupied by Russian troops starting on September 17, 1939; the broken line separates the German and Russian spheres of interest as of September 28, 1939.